Zirconia implants are durable nonmetal colored dental implants that will restore your bright smile. Over the years, patients have enjoyed having a more permanent solution for a missing tooth or teeth through traditional dental implants. Now, zirconia dental implants provide the same solution to tooth loss while containing no metallic color! If you have an allergy to metals or components of conventional titanium dental implants, then zirconium dental implants may be the solution for you. While dental implants present patients with a more permanent solution to tooth loss, zirconia implants have become increasingly popular for their durability, comfort, and titanium-free attributes. Using the most up-to-date technology, Dr. Stein proudly offers his patients the option of zirconia non-titanium implants. What is a zirconia implant? A zirconia implant, also known as a non-titanium implant, is a durable option for dental reconstructive surgery. The biocompatible nature of a zirconia dental implant allows for the seamless progression of the implant into your natural gum line. At New York Oral & Maxillofacial Surgery, Dental Implant Center, we believe in restoring your natural, confident smile with the most up-to-date technology. The biocompatibility of zirconia implants allows for a cohesive bond with the jaw bone with no visible discoloration due to the white coloring of the implant. Zirconia implants offer a more durable tooth replacement because the non-titanium makeup of the implant offers a higher fracture resilience rate compared to natural teeth. Why a zirconia dental implant? Zirconia or ceramic dental implants have a variety of positive features, especially when compared to dentures or dental bridges. Traditional replacements, such as dentures, look and feel less natural, with the ability to cause some discomfort. As dentures and bridges are removable, this can lead them to shift, loosen, or detach while eating. Requiring constant upkeep, removal, and cleanliness, a denture or bridge may prove to be a hassle to maintain. Zirconia implants are reliable, natural-looking, and do not shift or cause discomfort. Unlike dentures and bridges, you can enjoy your favorite foods without any embarrassment or pain, as dental implants function like your natural tooth or teeth. 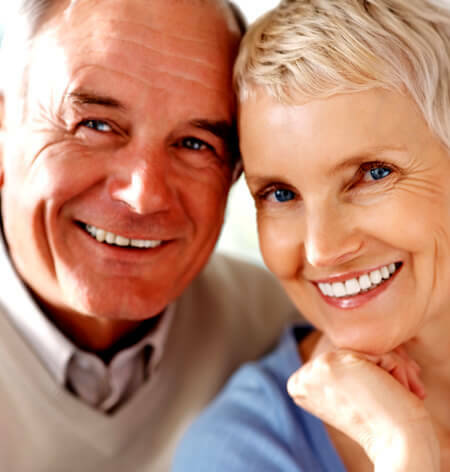 Traditional dentures also require specialized pastes for regular maintenance. Zirconia dental implants allow you the freedom of a natural smile and can be treated like a regular tooth or teeth. Zirconia dental implants require no specialized creams, pastes, or maintenance. Why is zirconia better than a traditional titanium implant? 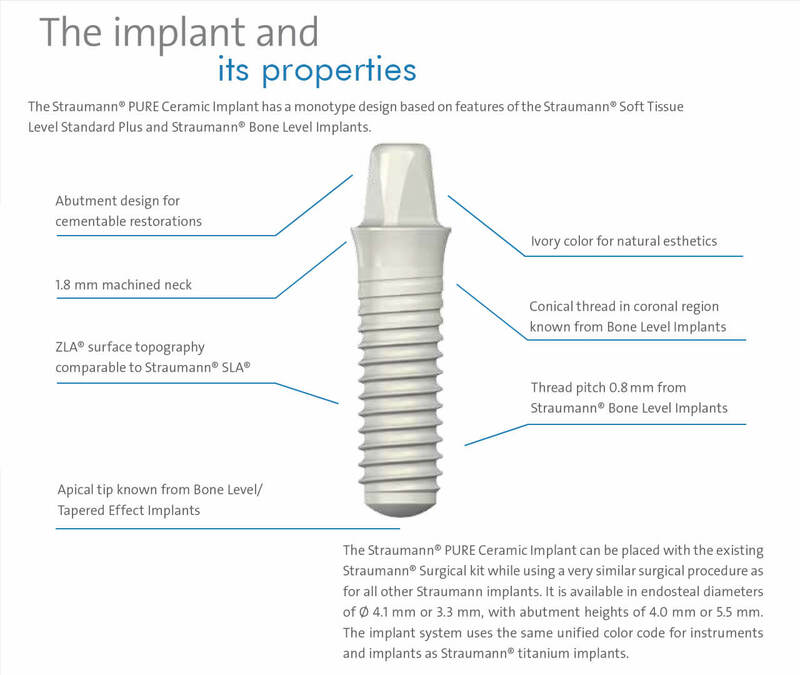 Compared to traditional titanium implants, zirconia implants contain no titanium. These non-titanium dental implants have no potential to corrode, and their biocompatible composition allows for an easier healing process after your procedure. On top of this, the natural ivory color of the zirconia dental implant provides a more realistic and seamless smile. This specific feature of the ceramic implant makes for a more natural smile. While titanium implants have been used prior to the introduction of zirconia dental implants, there are a number of improvements that zirconia dental implants can offer you. The zirconia dental implants have quick, expected osseointegration, or the direct structural integration between living bone and the implant. This healing period is where your implant securely anchors to your living bone. This secure fit provides a stable base for your crown to be placed on, assuring that your implant is fashioned adequately. Zirconia dental implants have a healing process that takes 6-12 weeks for a successful direct connection of the ceramic implant and living bone. The overall structural integrity of zirconia implants allows for longevity and a durable, lasting, natural smile. This process involves a period of time where the implant will be placed within your gum line. As your gum and jaw begins to heal, the implant and your bone and gum will bond with one another, securing a firm, healthy cohesion of the implant with your living bone. Zirconia dental implants are easy to maintain, and their white coloring provides a more pleasing aesthetic. Some implants have the potential to corrode in response to fluorides (toothpastes and mouthwashes), which can lead to implant failure. However, zirconia dental implants are resistant to corrosion due to their nonmetal composition. A titanium implant may leave a metallic discoloration or a slight gray hue around your gum where the titanium implant lies if you have a receding or thinning gum line. In cases like this, a patient may benefit from a nonmetal dental implant, which will leave no visible discoloration due to its white coloring. Patients respond differently to each type of dental implant, so Dr. Stein can help you determine which dental implant is best for your individual situation, needs, and desires. Most dental implant procedures are performed in office with the use of Intravenous Sedation or local anesthesia. During your procedure, the zirconia dental implant will be implanted into the jaw bone where the tooth is missing. After this initial visit, you will be given time for your gum and bone to heal and bond with the zirconia implant. Once the implant has successfully bonded with the bone and gum, you will then return to your restorative dentist to have your crown fitted directly into the nonmetal implant. With Dr. Stein's experience in dental implants, he is able to place a zirconia implant with minimally invasive techniques, which require minimal post-procedure discomfort and a short recovery time that will have you back to smiling soon after your visit. The procedure for one dental implant will only take between 15-20 minutes. After the procedure, you may experience a short recovery period with slight soreness lasting 1-2 days. Recovery time is different for each individual patient, and it is dependent upon the amount of implants you may require. How do I get started with zirconia implants? Dr. Stein and his staff would be happy to discuss zirconia dental implants with you. Please call 212-888-4760 or schedule an appointment online to arrange for a private consultation at our office. What is the procedure for a dental implant?